As far as formula goes, everything in this collection was pretty much the same. Smooth, no problems, and opaque in 2-3 coats. The flakies are thin and sit nice and flat against the nail (these aren't those awful, stiff flakies you'll find in many flakie polishes these days). Dry time is average. 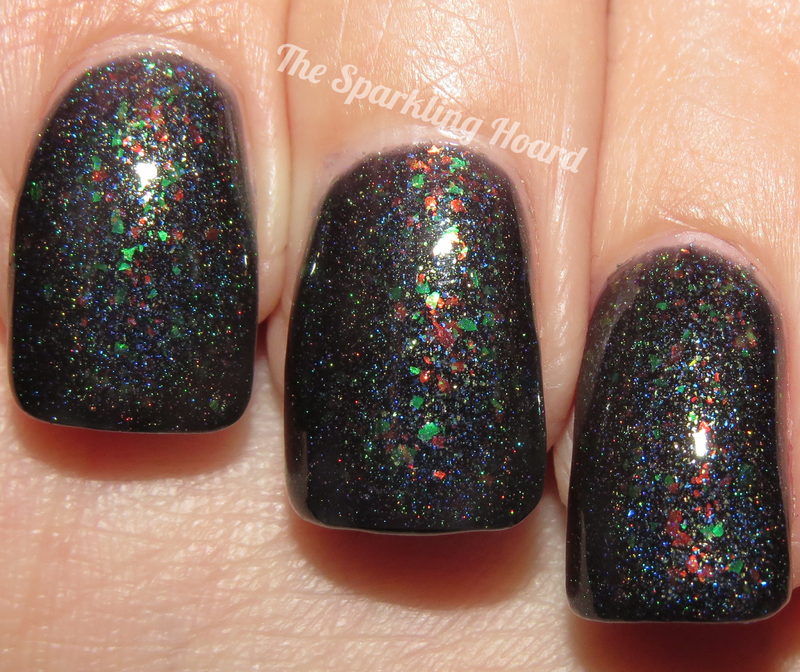 Rainbow in the Dark is a black jelly filled with large red and green multichrome flakies, small blue and gold flakies, and holographic pigment (loosely linear effect). It's a fun way to wear black, and it kind of reminds me of Christmas lights shining through the darkness! Molten Universe is a bright orange (red-leaning) jelly base filled with red/green (appeares red/gold) shifty flakies, red/green (appears green) shifting shimmer, and small purple flakies (very hard to capture on camera). 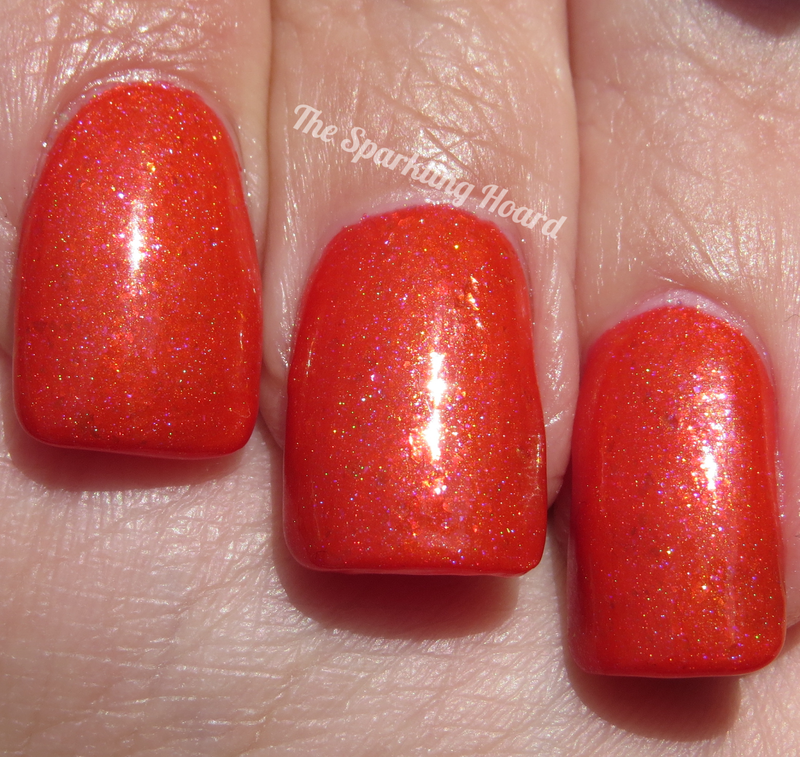 This color is great for both summer and fall! In sun, you can see the flakies nicely here! Storm Drops features a light blue (gray-toned) crelly base filled with silver flake and violet/aqua shifting shimmer. It's sort of a less dreary version of Illamasqua Raindrops! It also makes me think of Elsa from Disney's Frozen! Polishes from the Summer Rains collection cost $7.25 for 8mL (mini) or $12 for 15 mL (full sized) and can be purchased from the Indigo Bananas website or from international stockists listed HERE. Be sure to Like the Indigo Bananas Facebook page to stay up to date on the latest collections! 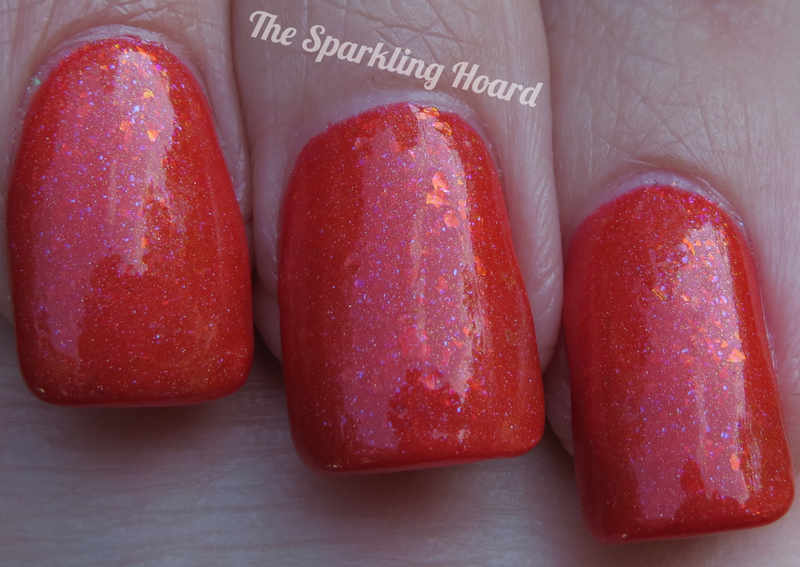 Hobby Polish Bloggers Facebook-Only Giveaway!